New studies confirm that to eat healthy, breakfast really can be the most important meal of the day. Researchers from a 2017 cohort study of more than 50,000 healthy adults found evidence that a lower body mass index (BMI) is associated with not only eating breakfast, but making it the biggest meal of the day. Other research claims include that breakfast eaters versus breakfast skippers may lose weight easier, and that when your breakfast is nutritious, and followed by a relatively smaller lunch and dinner, you may ward off extra body fat in the long term. Include a strong protein content to wake up your system, and bypass quickly digested carbs that can make you hungry again too soon. Many people love eggs in the morning for this reason: they’re considered a perfect fitness food with protein and fat that helps keep you full. Our bodies are better at processing food early in the day when insulin action is at its peak and able to breakdown glucose faster than later in the day. So, while sugary processed cereals are never a good call, adding some other form of complex carbs and/or high-fiber whole grains is. Many need to take breakfast on the run or eat at work—and that’s okay. In fact, delaying your first meal of the day can be an aid to weight loss when you decide to cut back on what would be dinner, later. You still need enough nutrients, so consider eating “dinner for breakfast” to close the gap. Short on time? Eggs are fast to cook and easy to make ahead, but you can explore more approaches to a big morning meal with leftovers from lunch the day before. Start with protein like meat, legumes or nuts, add colorful veggies or fruit, whole grains and some fat like avocado or grass-fed butter. Wrap it all up and you’re good to go. Heat up the oil or butter in a skillet, add chicken, peppers and onions, then crack in the two eggs and soft scramble. Add spinach and cheese to top and turn off heat. 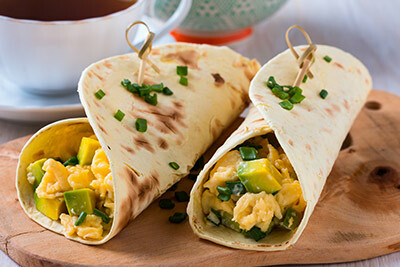 Fold the whole skillet mixture into your wrap and top with avocado and salsa to taste.